Won’t scratch as easily as the bare aluminum. Color will not fade away as easily. 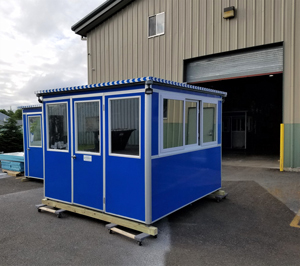 Indigo Blue 3M 1080 Vinyl Protective Wrap around the exterior of the booth. Optional color changes available – see under “Change Exterior Design” feature. Ability to shut all the power to the unit from the outside. 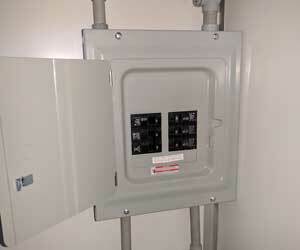 Exterior electrical disconnect switch; standard is rated for 30 Amps, can be upgraded if needed. Built into the unit – no need for portable heater that gets dragged around and lost. 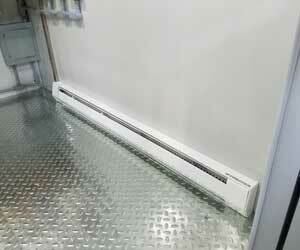 The price includes two baseboard heaters wired and installed along the two long sides of the booth. Includes a built-in thermostat next to the light switch. Keeps unit cool on the hottest of days. No need for portable fan. Nicely built into the unit. 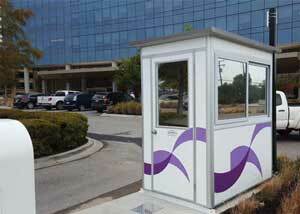 Increases your privacy; guard can observe bypassers without being noticed. Reduces heat inside the booth. Option of mirror tint or 15% black tint. Illuminates the surroundings at night. Makes the booth a noticeable point at night for easy accessibility. 15 Watt LED Spotlight wired and installed in the exterior corner of the booth; can be swiveled to point in any direction, and includes separate light switch. All the benefits of “Vinyl Protective Wrap” noted above, plus the ability to customize the exterior color. Display your logo, business hours, ticket pricing, and any other important information on the exterior of the booth. 3M 1080 Vinyl Protective Wrap – choose from list of 100 colors. Send us a PDF with your design to receive a quote. Have the conduit and wiring installed so your IT department can set up data and phone lines in the booth. 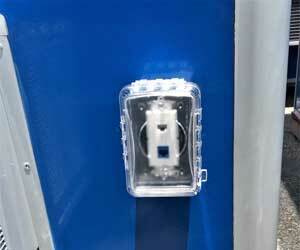 Includes conduit and boxes for Duplex Ethernet Port and Phone Line. 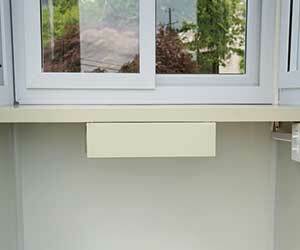 Request a quote for an additional desk with drawer on any side of the booth. 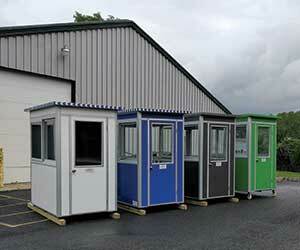 Great for large premises and temporary work sites. Flatbed Trailer Unit with 4×6 booth is $7,995.95. 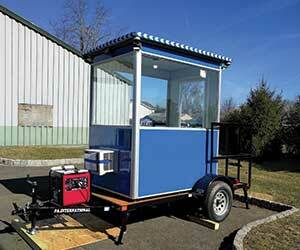 Flatbed Trailer Unit with 6×8 booth is $12,495.95; Other sizes quoted by request. Fixed glass window instead of sliding window. Sliding door instead of swinging door. 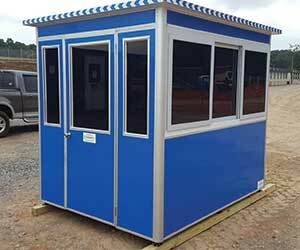 Add additional door on another side of the booth. 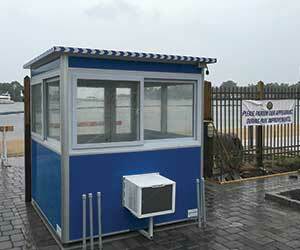 Fixed glass window with microphone speak-hole and transaction slot for ticket booth. Solid wall with 500 numbered key hooks for valet parking booth. Exterior counter for ticket booth customers to complete paperwork at the window. Metal locker installed underneath desk or anywhere in the booth.